Traditionally, the evaluation of metal microstructures and their physical properties is a subject of study in Metallography. Through microscopy, we obtain images of the microstructures of the material evaluated, while a human expert performs its analysis. However, texture is an important image descriptor as it is directly related to the physical properties of the surface of the object. Thus, in this paper, we propose to use texture analysis methods to automatically classify metal microstructures, more specifically, the phases of a Titanium alloy, Ti-6Al-4V. We performed texture analysis using the Bouligand-Minkowski fractal dimension method, which enables us to describe a texture image in terms of its irregularity. Experiments were performed using 3900 texture samples of 2 different phases of the titanium alloy. 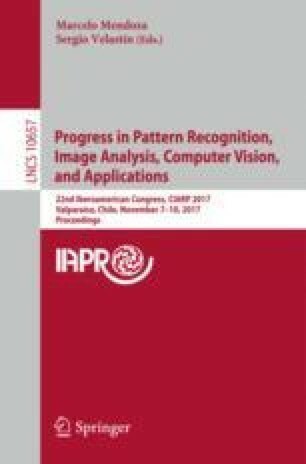 We used LDA (Linear Discriminant Analysis) to evaluate computed texture descriptors. The results indicated that fractal dimension is a feasibility tool for the evaluation of the microstructures present in the metal samples. André R. Backes gratefully acknowledges the financial support of CNPq (National Council for Scientific and Technological Development, Brazil) (Grant #302416/2015-3), FAPEMIG (Foundation to the Support of Research in Minas Gerais) (Grant #APQ-03437-15) and PROPP-UFU. Jarbas Joaci de Mesquita Sá Junior acknowledges the financial support of CNPq (Grant 453835/2017-1). We also thank the authors of the paper  for kindly providing the titanium alloy images used in this paper.